RPF SI SI Group Final Merit List Check Here. RPF SI 2018 Result Check Here. RPF Sub Inspector (SI) Answer Key Check Here. RPF SI PET Admit Card 2019 (All Region) Check Here. RPF SI 2019 PET Admit Card 2019 Check Here. RPF SI 2018 DV Test Admit Card Check Here. RPF SI 2018 Admit Card Check Here. RPF SI CBT Exam Schedule 2018 Check Here. RPF Roll No/ Scrutiny Status 2018 Check Here. RPF Notification is out. RPF is recruiting for 1120 Sub Inspector 2018 PET Posts. You can check RPF - Railway Protection Force last date, download RPF notification, visit RPF official website and check other RPF Vacancy details.Complete Vacancy and recruitment Details about 1120 Sub Inspector 2018 PET vacancies in RPF are provided below by JobSarkari.Com only for you. Last Date For Apply Online. 30/06/2018. Last Date of Pay Application Fee Online. 02/07/2018. Last Date of Pay Application Fee Offline. 05/07/2018. Date For Computer Based Test (CBT). September/October 2018. Rs. 400/- Will be refunded on Appearing in CBT. Rs. 250/- Will be refund in Appearing CBT. Mode of Payment. Candidate Can Pay Through Online Mode Through Debit Card, Credit Card, Net Banking or Pay Through Offline E-Challan Mode. SR, SWR and SCR. Male. 75. 21. 09. 21. 126. Female. 29. 09. 05. 09. 52. CR, WR, WCR and SECR. Male. 59. 48. 24. 13. 144. Female. 22. 18. 11. 05. 56. ER, ECR, SER and ECoR. Male. 149. 68. 49. 21. 287. Female. 59. 26. 18. 09. 112. NR, NER, NWR and NCR. Male. 96. 31. 36. 10. 173. Female. 39. 12. 14. 04. 69. NFR. Male. 21. 03. 05. 01. 30. Female. 08. 01. 02. 01. 12. RPSF. Male. 54. 01. 01. 03. 59. Female. 00. 00. 00. 00. 00. Total Vacancy. 611. 238. 174. 97. 1120. Candidate Must Have Passed Graduation. Height. Male. 165 CM. 160 CM. 163 CM. Female. 157 CM. 152 CM. 155 CM. Chest. Male. 80-85 CM. 76.2-81.2 CM. 80-85 CM. Running. Male. 1600 Meters in 06 Minutes 30 Seconds. 1600 Meters in 06 Minutes 30 Seconds. 1600 Meters in 06 Minutes 30 Seconds. Female. 800 Meters in 04 Minutes. 800 Meters in 04 Minutes. 800 Meters in 04 Minutes. Long Jump. Male. 12 Feet (2 Chances). 12 Feet (2 Chances). 12 Feet (2 Chances). Female. 09 Feet (2 Chances). 09 Feet (2 Chances). 09 Feet (2 Chances). High Jump. Male. 03 Feet 09 Inches (2 Chances). 03 Feet 09 Inches (2 Chances). 03 Feet 09 Inches (2 Chances). Female. 03 Feet (2 Chances). 03 Feet (2 Chances). 03 Feet (2 Chances). Ex-Servicemen and Others As Per Govt. Rules. 1. Candidate Can Apply Through Online Mode. 2. Candidate Need to Click on Apply Online Link Given on our Website in Important Links Section. 3. Candidate Need to Fill All Mandatory Details in Online Application Form. 4. Candidate Need to Upload All the Documents Along With Photographs and Signature in Prescribed Size As Mentioned in Notification. 5. Candidate Need to Apply Before 30th June 2018. 6. Candidate Advised to Take Printout of Application Form For Future Reference. Q. 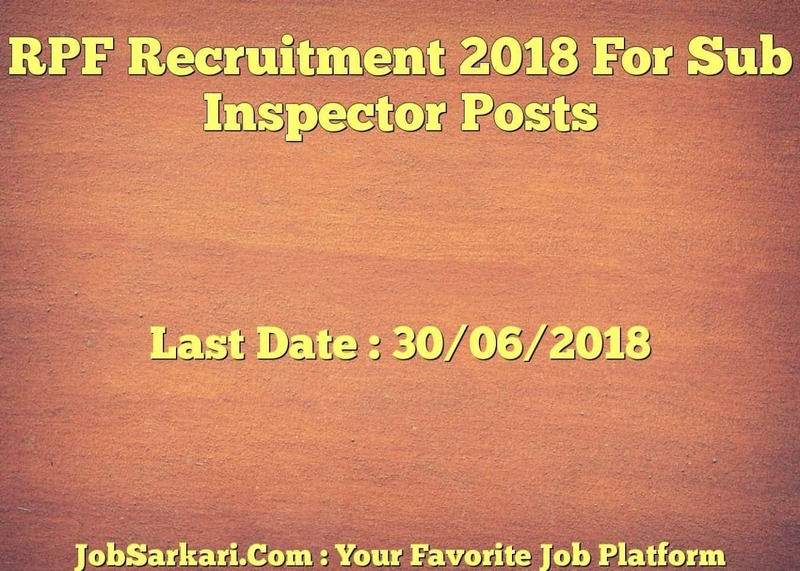 What is the Last Date For RPF Sub Inspector 2018 PET Vacancy ? A. Last Date for RPF Sub Inspector 2018 PET Posts is 30/06/2018. Q. What is the Form Type of RPF Sub Inspector 2018 PET Recruitment ? A. The Form Type for RPF Sub Inspector 2018 PET Posts is Online. Q. 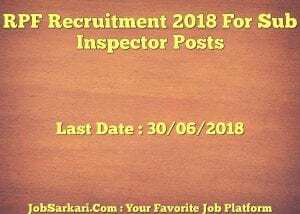 How many vacancies are available in Railway Protection Force Sub Inspector 2018 PET Posts ? A. There are about 1120 Vacancies in Railway Protection Force Sub Inspector 2018 PET Posts. Q. What is the Full Form of RPF ? A. Full Form of RPF is Railway Protection Force .